If you don't know which adhesive is right for your particular application please use our Adhesive Selector Guide link shown above to help you make your decision. Norland Optical Adhesives <Click here for info or to order. Norland Electronic Adhesives <Click here for info or to order. click above for info or to order. optical materials, My Polymers is a leader in this field. 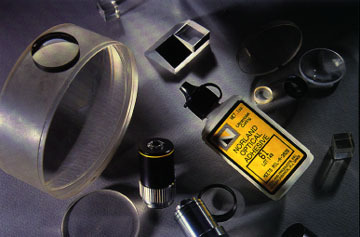 Their products are used as Optical Adhesives,Optical Cladding, Waveguides, and Optical Encapsulation. MY POLYMERS LOW REFRACTIVE INDEX ADHESIVES<Click here. MY POLYMERS FIBER COATING ADHESIVES<Click here. UV Light Sources <Click here for info or to order. The Norland collection of long-wave, ultraviolet light sources have been carefully selected to fit all of your bonding needs when using Norland Ultraviolet Curing Adhesive. Whether you are bonding lenses, tacking lectronic components, or curing optical splices, these lights are designed to cure the adhesive quickly and safely. Special features and designs have been added to some of these lights so that they easily work together with the Norland UVC Optical Splice. Technical Reports <Click here for info. Technical reports on using Norland Optical and Electronic Adhesives. Who uses Norland Adhesives <Click here for info. See how companies use Norland Adhesive for your application.